This rental is within walking distance of Schroon Lake Hamlet. Snowmobile trails close by, 25 minutes from Gore Mountain, walk out on the lake for ice fishing!!! Enjoy this family retreat year around. This Chalet is one of THREE rentals on the property. The Chalet sleeps 6. A short walk to stores, churches, restaurants and the skiing at the Town run sledding/skiing slopes on the Golf Course is just around the corner. Toasty warm Chalet after a fun winter's day. Paul and I purchased these properties in 2007 and enjoy sharing our 'find' with others. 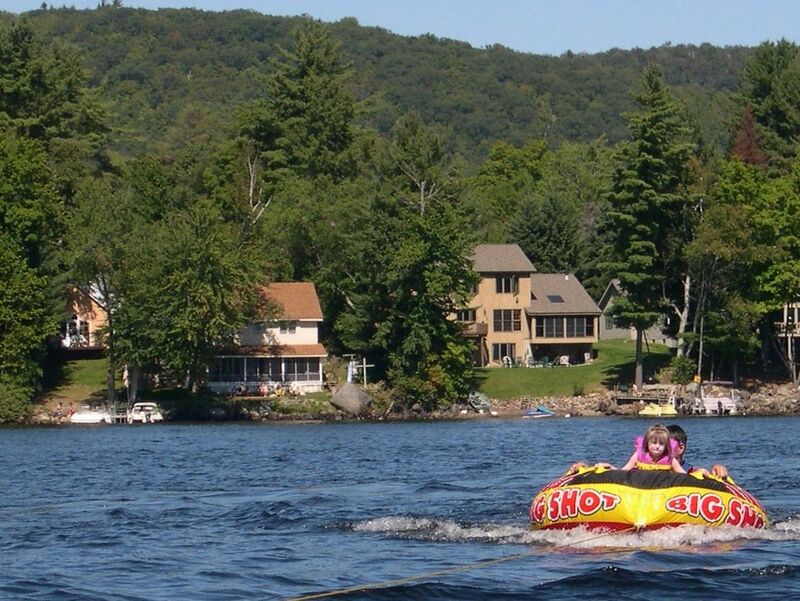 We hope our renters enjoy the Adirondacks and year round fun as much as we do. The Chalet offers a cozy atmosphere and beautiful views of the lake. This house is convenient to lake, golf, stores, and has all the conveniences of home. Gore Mountain is 25 minutes away. The house is within walking distance of stores, restaurants and the lake. The main house (#169543) has room for 10; the Chalet (#194658) room for 6 and the new house (#3827122) room for 8 (3 bedrooms and a pullout couch). It's a great getaway for a family, family reunion, and friends. village 1/4 mile from Chalet - Tops Supermarket, Strand Theatre, Timberwolf Restaurant, Laundromat, Town Store, churches, town hall and town beach within walking distance. Beautiful view of Pharoah Mountain and the Word of Life Island. Stone steps lead down to a small beach (depending on the water level of the lake). Also a dock is available for docking up to a 20' boat. Cozy clean cottage right on lake. Easy trip to Gore and other winter locations. This property was wonderful. Beautiful view and perfect distance from Gore! The house was very clean and a great space. Would definitely stay here again. This worked out perfect for our party of 5. Loved being on the frozen lake and only 24 minutes from Gore mountain. Two nice restaurants walking distance and they plowed when it snowed. Would definitely stay again next year. Thanks! Very convenient to the village of Schroon Lake. Clean, comfortable, and all essentials were provided. Exceeded our expectations. Look forward to renting again next year for a weekend. Much nicer for the cost compared to a rental we had last year in this area. We all enjoyed our stay everything was better then expected. Hope to return next September or sooner. The Chalet, main house next door, and the new ranch house by Route 9 offer plenty of room for a great retreat. The Chalet sleeps 6 and the main house sleeps 10 and the new ranch house sleeps 8. 75' from the shoreline, the Chalet has a beautiful view of the lake - dock access. Golf: Golf is just around the corner on Hoffman Road and is very reasonably priced. Ski: Only 20 minutes from Gore Mountain, this quaint Chalet offers an inviting propane stove to sit by after a day of skiing. It's a short walk to Schroon Lake Hamlet. Plenty of restaurants to choose from. It's a quiet retreat on a snowy night. It sleeps 6 and have a lovely view of the lake. Off Season $175/night, please see our 4 Bedroom, 2 bath lakefront Family Retreat rental next door - Homeaway listing #169543 and our ranch house #3827122. Families have rented all three places for a summer retreat.